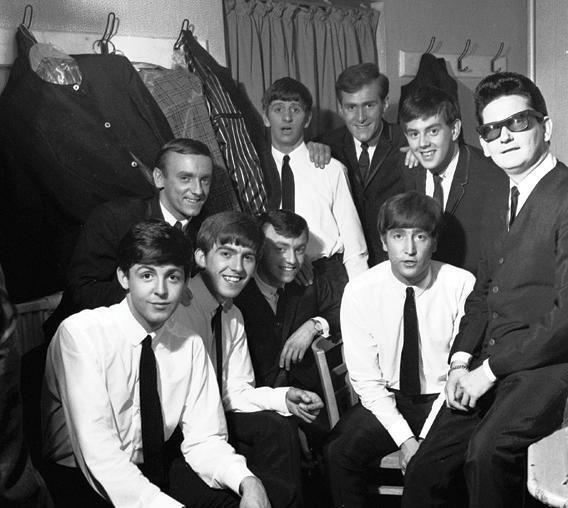 The Beatles’ tour with Roy Orbison: Even The Beatles struggled to follow Roy Orbison. Brow Beat is following the Beatles in “real time,” 50 years later, from their first chart-topper to their final rooftop concert. 50 years ago this month, the Beatles went on tour with one of their idols, Roy Orbison. According to Roy Orbison, when he was first asked by Brian Epstein to tour England with the Beatles, he responded, “What’s a Beatle?” Orbison was fresh off hits like “Only the Lonely,” “Crying,” and “In Dreams,” and his popularity was rising fast in the U.K., but he wasn’t yet used to Mersey Beat bands with such goofy names. It was his first U.K. tour, and, as Orbison later recalled, he didn’t know what to expect. But the president of the Roy Orbison Fan Club wrote him a letter, explaining that touring with the Beatles would be terrific for him. They were No. 1 in England, Orbison’s fan explained, and would get him more exposure. There was, at first, no doubt about who the headliner would be. The Beatles backstage at the Roy Orbison tour with Gerry and the Pacemakers. This photo is excerpted from The Beatles in Liverpool, by Spencer Leigh, courtesy of the Mark Naboshek Collection. Nonetheless, by the time Orbison arrived in the U.K., his one-time opener had surpassed him in popularity. In a concession to audience demand, Orbison graciously agreed to share co-billing, and to let the Beatles close out each night. Of course, the Beatles were beginning to grow quite a repertoire themselves by this point. Their standard set consisted of “Please Please Me,” “Love Me Do,” “Some Other Guy,” “Do You Want to Know a Secret,” “From Me to You,” “I Saw Her Standing There,” and “Twist and Shout.” So they didn’t fare too poorly either. Beatlemania was starting to set in, and they were being pelted by jellybeans night after night, just because George had mentioned liking them in an interview. 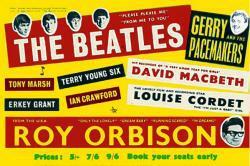 Poster for The Beatles’ tour with Roy Orbison. The competition between the two groups spilled over to the tour bus. Paul later remembered how at the back of the bus Orbison would be writing songs like “Pretty Woman,” and it would just about make them jealous: “He would play us his song,” Paul said, “and we’d say, ‘Oh, it’s great, Roy. Have you just written that?’ But we’d be thinking, ‘We have to have something as good.’ ” As would later happen with groups like the Beach Boys and the Rolling Stones, their competitiveness with Orbison inspired them to produce some of their best work. For his part, McCartney was writing such songs as “All My Loving,” which he began composing on the tour bus and worked out on the piano at one of the venues.